Hortus Camdenensis | Dictamnus albus L.
Fully hardy clump-forming perennial with white or pinkish-white flowers in early summer. There are a number of garden cultivars, with rosy-red to purplish flowers. To 90cm. [RHSE, Hortus]. The plant releases a lemony essential oil which may be ignited, leaving the plant unharmed, hence the name Burning bush. ‘This is one of the oldest and best border plants of our cottage gardens. Instances are known where the Fraxinella has outlived father, son, and grandson in the same spot, without increase, all attempts at multiplying it, to give away a rooted slip to a newly-married member of the family, having failed.’ Introduced to Britain in 1596 from Germany. [JD]. ‘This plant, for its beauty and fine scent, deserves a place in every collection.’ [Don]. ‘White Dittany or Fraxinella. 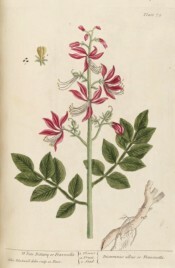 Dictamnus albus or Fraxinella. It grows to 2 foot high, the leaves are a dark green, and ye flowers red & sometimes white. It grows wild in several places of France and Germany; but is planted here in gardens and flowers in June and July. The roots are esteemed cordial and cephalic, good to resist putrefaction and poisons, and useful in malignant and pestilential distempers. It is accounted good for epilepsy & other disorders of ye head, opening obstructions of ye womb & procuring ye menses. The preparations are the Aq. Antileptic, Theriacal Pulv. Liberans, Empl. Stipticum Paracels.’ [Blackwell pl.75/1737]. Listed in all published catalogues [H.94/1843]. 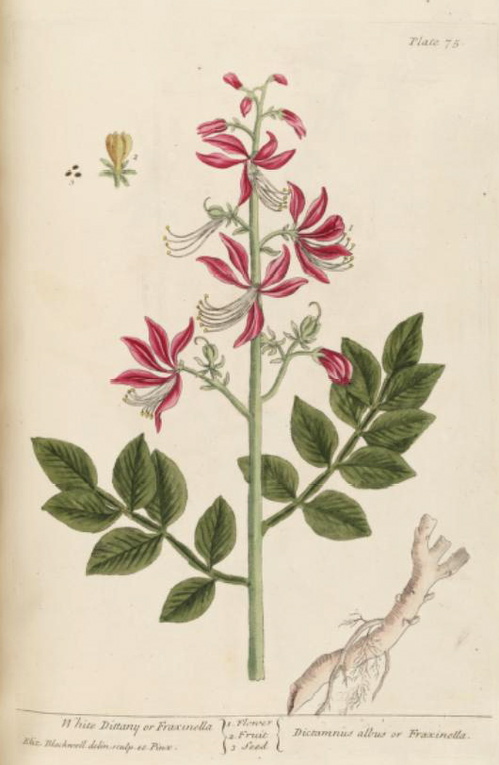 More details about Dictamnus albus L.
Dictamnus fraxinella Pers. var. alba DC.